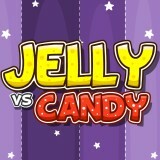 Jelly vs Candy: Shoot candies with your jelly. Look at the position of your tiny jelly and other candies and tap on the screen to launch the jelly straight to the spikes. Make sure it will be stopped by candies!